The Mantis ComposT-Twin dual-chamber composter holds almost 25 cubic feet of raw material – that’s 350 litres in each chamber! 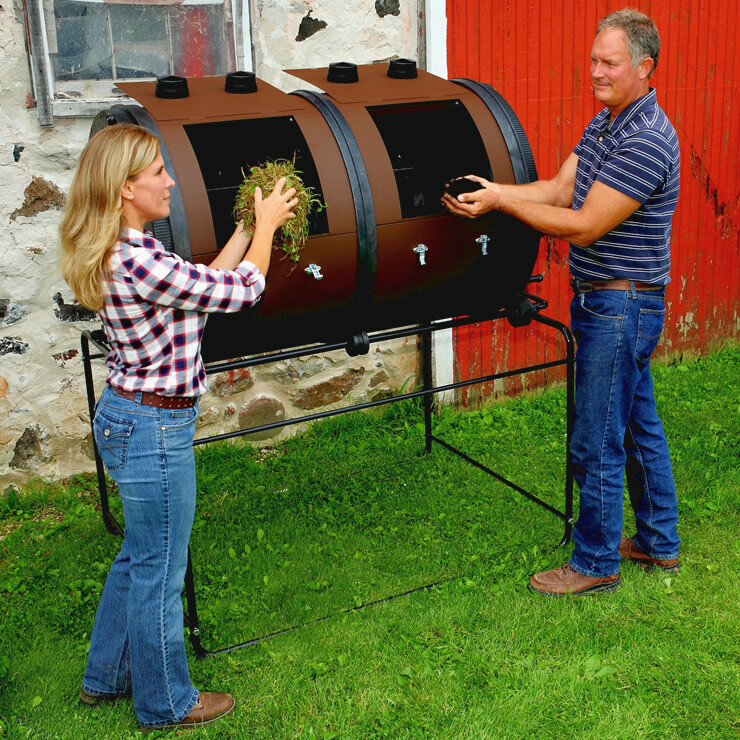 Unlike traditional single-bin composters, the Mantis composter allows your compost to “cook” in one composting bin while leaving room for you to fill the second composting bin with more kitchen and garden scraps. Aerator vents on each door allow oxygen into the chamber while vented end caps assure even air flow and proper drainage. Bin contents are fully enclosed and latched to keep out rodents, pets, and other wildlife. No more messy, unsightly compost piles, no odours wafting over to your neighbour’s porch. It’s easy to remove your finished compost. 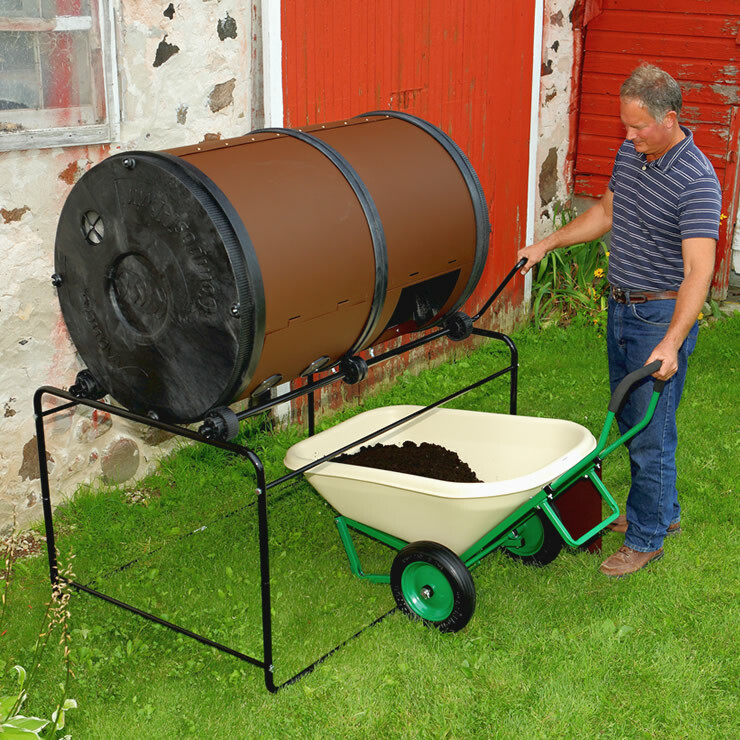 The ComposT-Twin frame is a convenient 32″ high for easy loading and unloading. 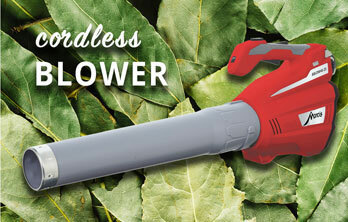 The easy-crank handle and gear mechanisms make the drum easy to turn – even when fully loaded! 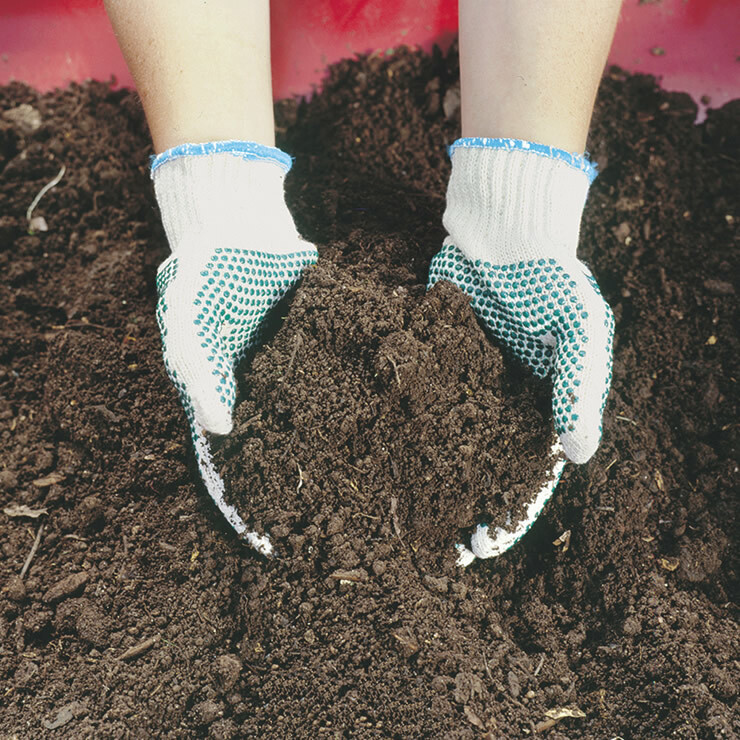 Make compost from your own garden and kitchen waste in as little as 14 days. 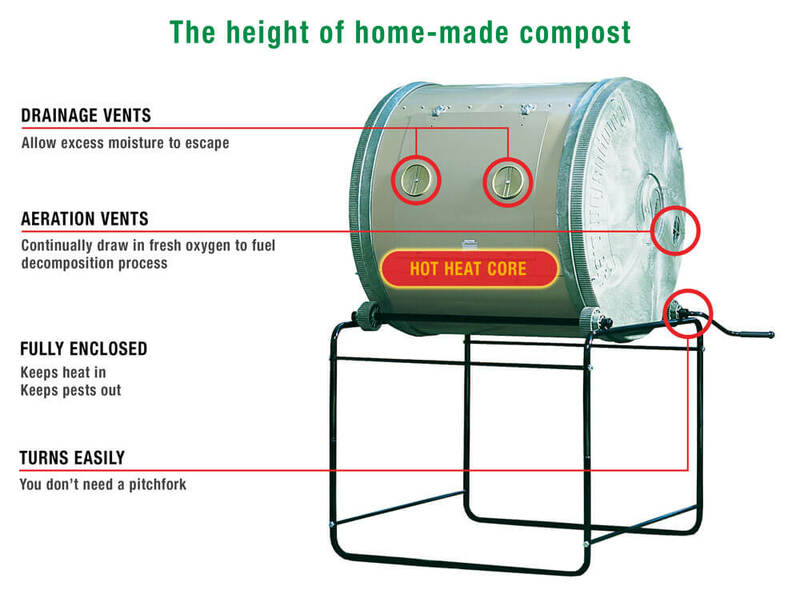 The Mantis ComposT-Twin dual-chamber composter holds almost 25 cubic feet of raw material – that’s 350 litres in each chamber! 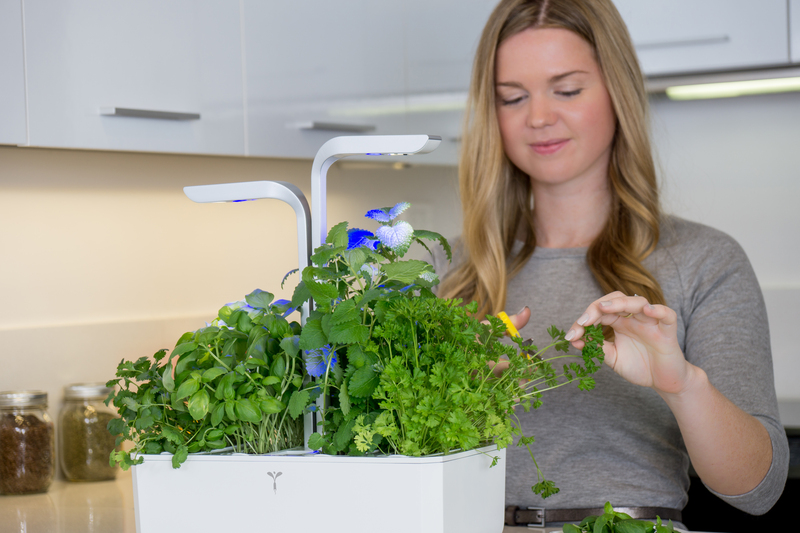 Unlike traditional single-bin composters, the Mantis ComposT-Twin allows your compost to “cook” in one composting bin while leaving room for you to fill the second composting bin with more kitchen and garden scraps. Aerator vents on each door allow oxygen into the chamber while vented end caps assure even air flow and proper drainage. Bin contents are fully enclosed and latched to keep out rodents, pets, and other wildlife. No more messy, unsightly compost piles, no odours wafting over to your neighbour’s porch. It’s easy to remove your finished compost. 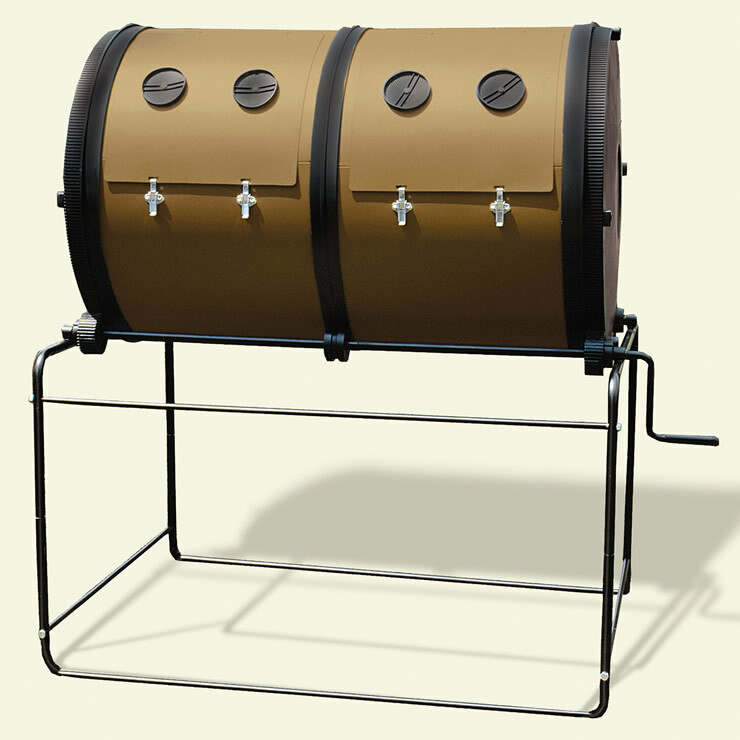 The ComposT-Twin frame is a convenient 32″ high for easy loading and unloading. 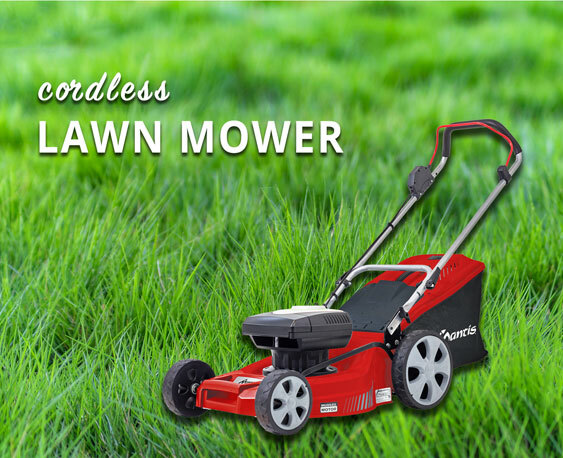 The easy-crank handle and gear mechanisms make the drum easy to turn – even when fully loaded! 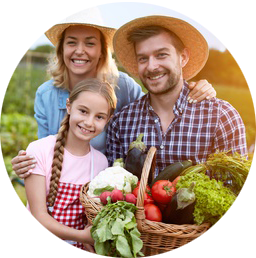 Make compost from your own garden and kitchen waste in as little as 14 days. 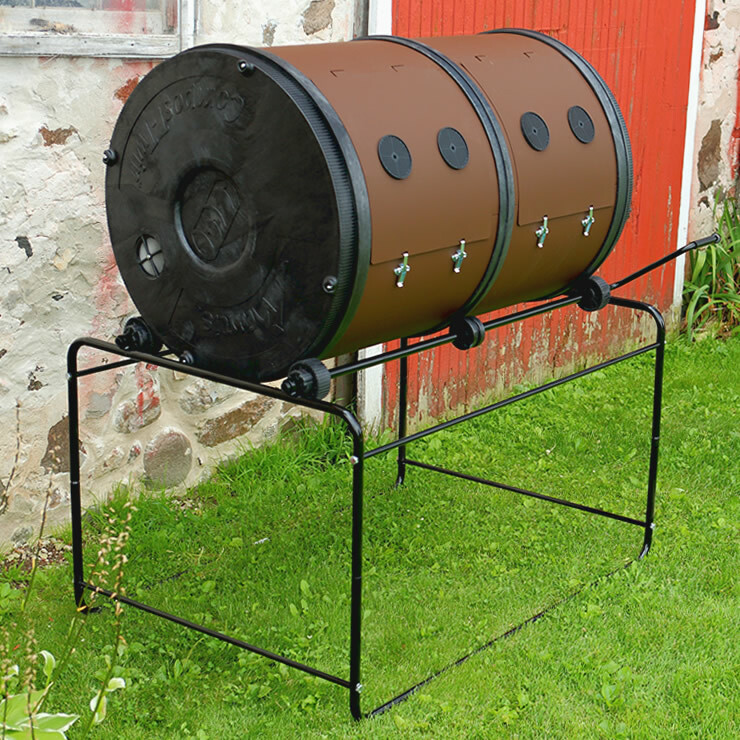 The Mantis ComposT-Twin dual-chamber composter produces a constant supply of compost faster! Overall size: 65″ wide x 66″ high and 40″ deep. 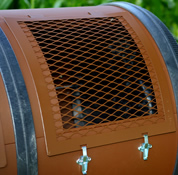 This composter helps take the guesswork out of successful composting. Interior “fins” help to mix material as drum is rotated. 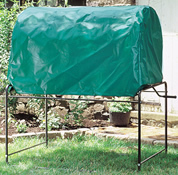 No more messy, unsightly looking compost bin in your garden. No odours wafting over your neighbour’s fence. Mantis ComposT-Twin is easier to turn than other composters; and you don’t have to get on your hands and knees to unload finished compost. Holds up to 700 Litres for composting, in two 350 litre drums. Holds over nine 75 litre garden waste bags of material. Powder-coated galvannealed steel, rust-resistant. End caps and divider made from BPA-free, food grade plastic. Compost “cooks” in one side, while you continue to add compostable materials to the other side. No mess, smells, or unsightly composting bin in your garden. Contained and elevated to deter pets, rodents and other wildlife. 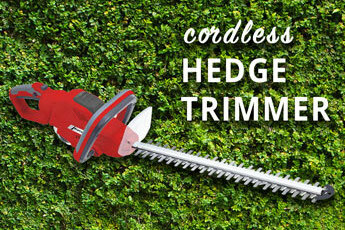 No back-breaking work to mix and aerate the pile – just turn the gear-driven handle. 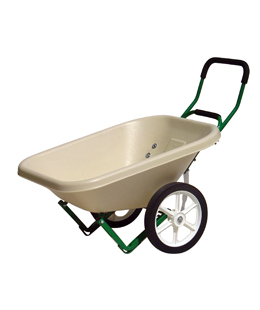 No struggle to remove finished compost – just place a wheelbarrow below the composting bin, turn and empty.